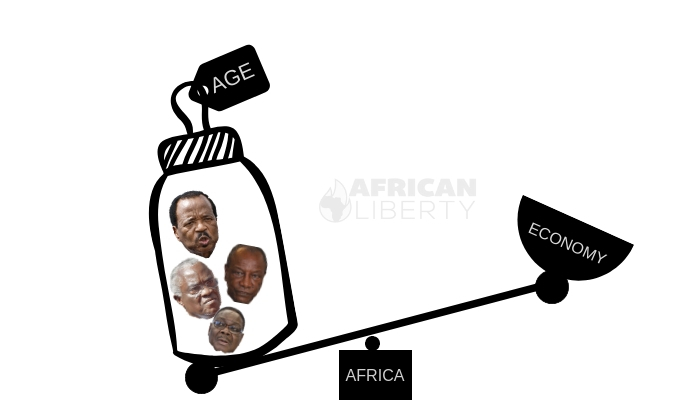 Is the Age of African Leaders the Continent’s Heaviest Burden? In the last few months, policymakers and economists have raced to find answers to the many reasons why African countries continue to poorly perform according to some development reports. Such inquiries are necessary considering these reports does not only show how slow Africa is pacing with the rest of the world but also reveals some dangerous economic trends. Unfortunately, nearly all the reasons identified have failed to point out what is arguably the bedrock of all other problems – aside corruption: the incredible age of some African leaders and the possible impact it has on the quality of leadership. Although, to a great extent, there is no established law or theory that proves the age of an individual or the number of years spent in power, determines such individual’s leadership performance. However, there are reasons to believe that youthfulness, and a periodic rotation of power could positively impact the development of a low or middle-income country. This especially if the age distribution of such country is youthful. The mean age of the ten oldest African leaders is 80.2 years, an extremely high figure in comparison with the average age distribution of the continent, which is just 19.4 years. In other words, one out of Africa’s ten oldest leaders is four times older than the regular African. Significantly, though, the average age of leaders of the top ten most developed countries in the world is only 52. But a more significant reason to consider this disparity as a determinant of performance is that these African leaders – like almost all contemporary African leaders – are far too old than the countries they govern. 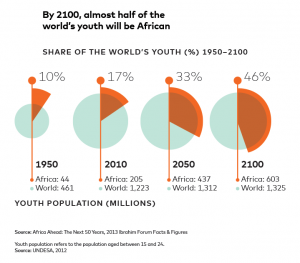 A substantial number of African countries today are only between 43 to 60 years old post-independence. 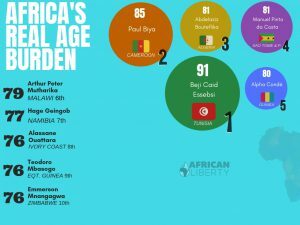 Interestingly, the youngest leader on the continent is 42 years old, which is pretty much close to the lower average age of independent African countries. This, obviously, is a serious demographic problem but does it in any way affect leadership performance? The answer is most likely a yes. Whereas, the changes in culture and economic behavior in every human society from time to time, warrants a periodic change in leadership to allow for innovative means of meeting societal goals. One might want to consider the fact that the GDP per capita rankings of African countries with the top ten oldest leaders are all below 100 globally – except for Tunisia at exactly 100th. More so, these African leaders have spent at least 20 consecutive years in power, which again, is a far cry compared to the 10 year limit of the most developed countries in the world, excluding China and Japan. Or better still, in comparison with equally well-performing domestic economies like Ethiopia and Botswana. The issue with having one man in charge of a country for more than often due – conventionally 5 to 10 years – is that the longer such individual stays in power, the less room there is for innovation in policies. And this is usually irrespective how cabinet often reshuffle, as proven in the administration of Robert Mugabe (Zimbabwe), Yahya Jammeh (The Gambia) Yoweri Museveni (Uganda) and others like them. This is because in most cases, a leader will have certain guiding principles in managing state affairs and peculiar philosophical approach to issues. Whereas, the changes in culture and economic behavior in every human society from time to time, warrants a periodic change in leadership to allow for innovative means of meeting societal needs. A country without a periodic change in leadership, on the other hand, would be deprived of such innovations over time. Change in leadership is necessary for progress. It opens the political structure of a country to groups that may not necessarily agree with the status quo through criticism and alternative policies. It is by this open competition and peaceful transition of power that the quality of leadership can be of high standard. Again, I do not totally subscribe to the view that age determines leadership ability. Although, I believe good leadership should start with a blend of experience and youthfulness. 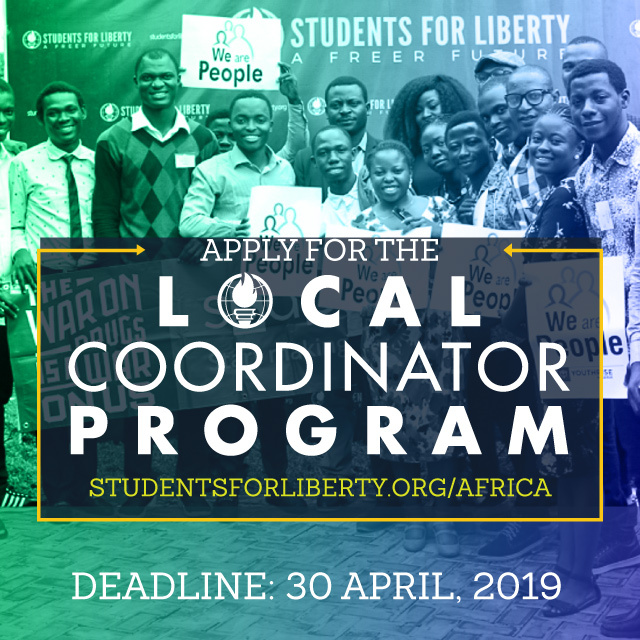 I will also slightly disagree with those that advocate for young leaders on the basis of Africa’s youthful population without underscoring qualification as a prerequisite. Today, investing in the tech industry and supporting the urban pop culture alone provide lots of jobs, not to mention other youth-driven opportunities. This school of thought often highlight the fact that African leaders and their cabinet still adopt older generation solutions to new generation issues. As much as this is true, things are not always black and white in governance. For instance, African leaders are found of approaching the issue of unemployment by creating welfare schemes or investing in education. Of course, these are two of the conventional ways of addressing the issue, however, such a challenge in this millennium have smarter solutions. Today, investing in the tech industry and supporting the urban pop culture alone provide lots of jobs, not to mention other youth-driven opportunities.  One cannot simply expect most African leaders, who neither grew up experiencing these new trends nor tolerant of critical opinion, to be flexible to these options. Maybe the young Africans, who are the real victims of the many problems facing the continent, should as a matter qualification, be in charge of their own destiny.